A ‘watching’ public press foresees a leaderless EU! OED definition of ‘spectator’ – ‘a person who watches at a show, game or other event’. Immediately, I’m reminded of the prophecies brought in 2015 and 2016 through David Noakes and Patsy Southway of the fall of the EU (Fulfilled Prophecies #13 & #14 et seriatim) – as well as through Revd John Kilpatrick in Dec 2015 on a coming shaking and jolting of nations, and ‘Sue’ some years previously (under ‘Voice of Believers’ in UK/EU in/out #3 – In the Face of God). 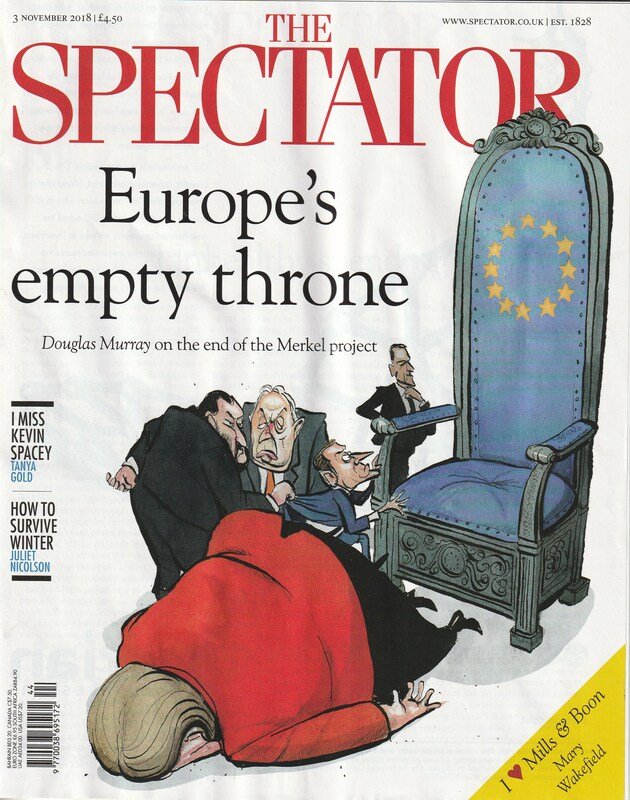 As expected from this periodical, Douglas Murray’s analysis Mutti’s Last Days – Angela Merkel is on the way out, and so is her vision for the European Union is worth taking time to read for his informative opinion. PS. see Update in the next post. For more, visit this blog’s hubs on Brexit versus EU and of Brexit Prophecies. This entry was posted in Europe-EU, Geopolitics, News and tagged Brexit, Government, Prophecy-fulfilled by Richard Barker. Bookmark the permalink. ‘I am amazed by your post and the picture of the fallen Merkel, in red. I replied that I recall seeing a front page photo only days before PM May’s ‘Chequers’ farago of her grinning at ‘Mutti’ and I perceived in that ‘private’ look they were of one mind and had already come to a working agreement on Brexit. Perhaps that’s why instead of being a true-blue Brit our ‘M’ has taken to wearing a red jacket like Germany’s ‘M’ ?